For Autumn I really want to move away from wearing jeans all the time and wear more dresses with tights and boots. These boots would be perfect as it looks like they would fit nicely around the ankle - but they could work with skinny jeans too. I love the buckle detail and could actually have a pair of these in every colour - grey, black tan and burgundy. I would say this is more burgundy than red and I LOVE the colour, it's my favourite Autumn colour! I need a new coat for the upcoming cold weather and I love the style of duffle coats, plus it has a hood for practicality! I cannot believe this is only £19.00 - I need to hunt it down pronto! I'm a sucker for a tan bag - the colour is timeless and just goes with everything. My current bag is beginning to wear in places, so it seems like the right time to replace it. This one from Accessorize has a classic style and colour, with a detachable strap for wearing over the shoulder. New Look just doesn't disappoint when it comes to affordable fashion and this is a classic example. 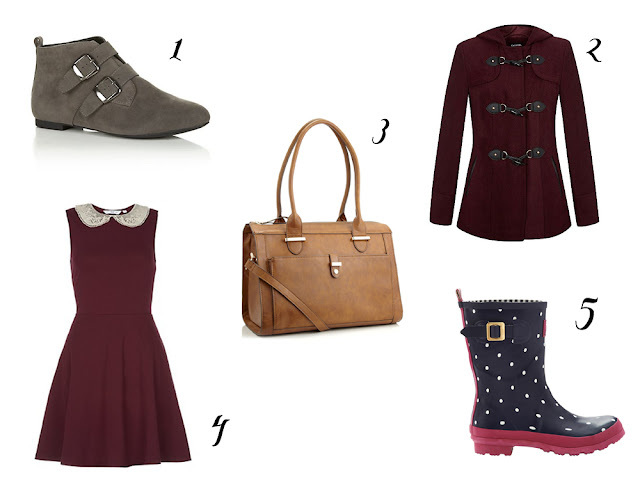 This ticks so many boxes for me; a bargain price - check; skater style - check; burgundy - check; peter pan collar - check. This would work for daytime with pumps or boots and for night time with heels and a matching lipstick. I've only recently discovered the amazing selection of wellies in Joules! They're not the cheapest but they are oh so nice! I went in store to have a look (they didn't have my size, sob!) and you can tell they are fantastic quality, the rubber is really soft and flexible. I love the fact that they do a selection of mid length wellies and this design is super cute. The change of seasons isn't going to do much for my bank account! But I really do need a new coat, some new boots and a new bag as a minimum, as my existing ones have got to the point of looking scruffy and worn. What's on your Autumn fashion wishlist? That same exact dress is in my wishlist too, everything's so gorgeous!